By default, the Etudes gradebook includes an Extra Credit category. This is a special category that exists in all gradebooks and cannot be removed. If you don’t use Extra Credit in your course, not to worry. It will not appear in your students’ list. Any categories that have no assessments under them are not listed in the student view. You can delete empty custom categories, but not Extra Credit, as the functionality needs to remain there for when it’s needed. 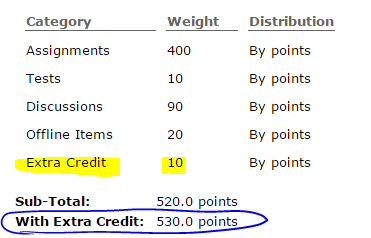 The Extra Credit category understands that assessments associated with it count over and above the total points or weight for the course grade. Thus, you don’t have to treat extra credit assessments differently. Just place them in the Extra Credit category in the Overview page of your gradebook. By associating these with the Extra Credit category, Etudes knows how to handle them when calculating grades for students who complete them. You may set up assessments in Assignments, Tests and Surveys or in Discussions as extra credit. Each extra credit assessment can be worth as many points as you wish. The extra credit points earned are over and above the total possible for a course, and they will not affect students who do not complete it. If you like working with points, leave the gradebook’s settings at its default options, and Etudes will use your point values of the extra credit assessments to award students who complete them the additional points. If you calculate your class grades by weights (as opposed to points), go to Categories >> Click on Edit, and set the weight for your extra credit. To inform Etudes that you want specific assessments to be treated as ‘extra credit’, move them to the Extra Credit category under the gradebook’s overview page. Click on Overview at the top menu of the gradebook. Then, click and hold hold down the ‘sort’ blue arrows of the item you want to move and drag it to the extra credit category (or use the numeric drop-down option). Click on Save at the bottom. ​Any scores earned in extra credit assessments will be added to the total possible points (or percentage) for the overall grade only for students who complete them. * Extra credit is calculated relative to the proportion that it represents in relation the total possible for the required work in the entire course. 25 points is 5% of 500. 475 points out of 500 for the required work. That’s 95%. 15 points for extra credit. 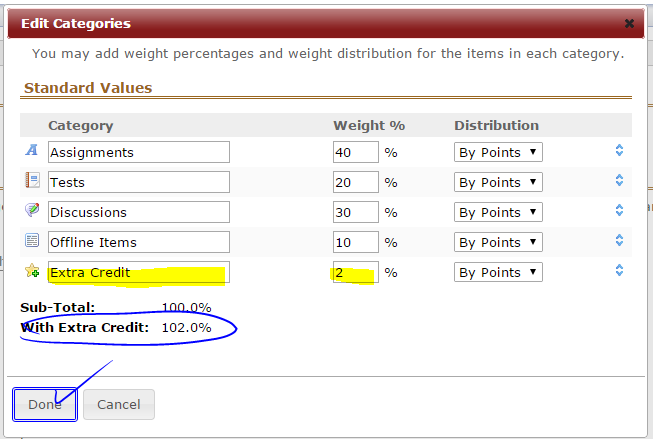 That’s 0.75% (15 points earned x 5% of the extra credit’s weight). Suppose you have 1000 points possible in your assessments, and have set the gradebook to calculate grades based on weights. A student completed 850 points out of 1000 for the required work. That’s 85%. The student completed 25 points for extra credit. That’s 1.25%.